Saturday was to sum it all up, pretty much amazing!! I can't even begin to express how much fun I had. Being on the river was so exciting and adventurous. All week I had been looking forward to this trip. Last week I was going through some of my pictures from last year, remembering all the adventures I had. 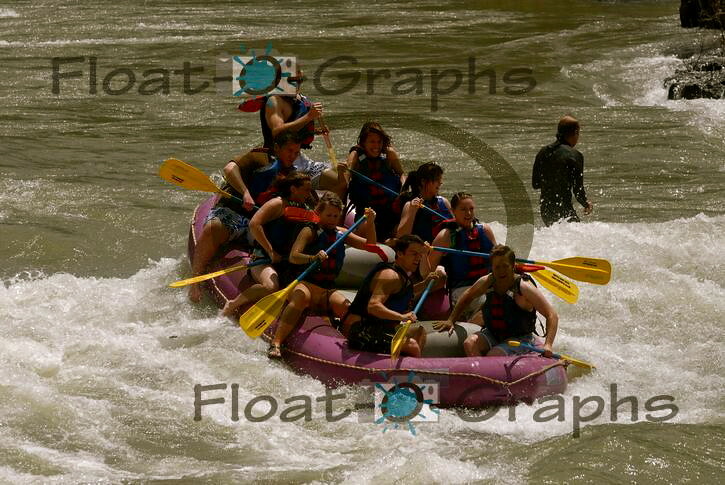 I was looking through the pictures of the rafting trip we took last year and got depressed. For some reason it hit me that I most likely was not going to be able to go down the river again this year. Every year since I was either eleven or twelve I have gone rafting at least once, whether it be down the Deschutes in Oregon or the Snake here in Idaho/Wyoming. 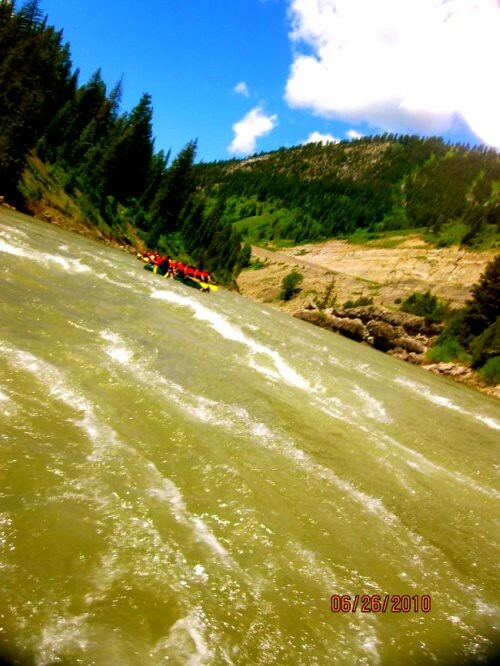 White water rafting is on the top of my list of favorite things to do. I get so excited thinking about it. I love the water and the trill of going through rough water. Anyways, as I was looking through those pictures the thought came into mind that it was not going to happen this year. Little did I know that last Saturday after Melissa's wedding reception, I went over to Kendell's house and Reed told me about the trip they were planning for the following Saturday. He asked if I wanted to go, and of course I could not turn it down. There was about twenty of us and we had two rafts. Like last year we had to split the group in half and pretend we did not know the other group. We had to do this because we did not have a permit, and any group over fifteen people were required to have a permit. The forest service is very strict about it and we were all a little nervous. Once we got on the river though it was all fun and games. This is a picture that Dustin (on the left) insisted on taking. Last year the three of us took a similar picture (as you can see posted below this one.) It's interesting to see how all of us have changed and yet stayed the same. We had just gotten onto the river. The wind was really strong and at first it was overcast. I was ok with it being overcast because that meant it would be warmer, but I feared that the wind would make it really cold. I was sitting up from on the right which meant I would get hit the most with the waves. I was fully aware that this was going to happen, and was ok with that. The front right is where I always sit. The other group. They had eleven people in theirs, while we only had nine. There were a group of girls who refused to split up. Honestly eleven is too many people on a raft; especially when it is only meant to hold ten. Our raft was ok with just having nine; less crowded. Reed and I. I just have to put it out there that I have given him crap for the mustache. It hasn't done any good apparently. Hehe. I guess we'll just have to take him down and make him shave it off. This is the whole group. Before Big Kahuna we pulled off to the side to rest. A group of kayaker's had pulled off to and one of them after taking a bathroom break was kind enough to take the picture of us. We stayed there for about fifteen minutes before finally going again. For Christmas last year I had gotten a waterproof case for my camera. My parents knew how much I love taking pictures, and during the summer I spend a lot of time in the water. Now I don't have to go through the pain of buying waterproof cameras and then have them developed. It's so much nicer now with the case. I got lots of compliments on it. I was able to take videos. They aren't the best because I had to focus on paddling and so I would just let my camera hang there. You will see what I mean when you watch this one. In all the years I have been rafting I have never fallen out. I've been thrown in, but never fallen out because of a rapid. This year I did. I didn't realise what was happening until I was in the water and my feet were touching the bottom. The video is moves around a lot, but you know when I have fallen out. It was a thrill and for a split second I got scared, but everyone got me back into the raft really quick. There was three of us that fell out and it was at the bottom of Big Kahuna. Are boat started to flip and that is when we all fell out. Luckily the raft ended up not flipping. Enjoy the movie! I'm hoping I won't get into to much trouble for this, but I found the site where they take the pictures of rafts going down Big Kahuna. You can see the look of concentration on my face as I get ready to take on this class three rapid. Both groups had somewhat of a scare. In the other raft Nate had lost his oar and so he jumped in after it. It happened after a series of rapids and so he got caught in a whirlpool and kept getting sucked under. Our raft was after his, so we saw him jump in, but we weren't able to get to him. Both rafts pulled over to the side quickly, and Kendell and Reed hiked up to the road to back track to see if Nate was ok. Luckily Nate was ok and was able to climb up some rocks. The only way those of us still in the rafts new he was ok while we were waiting was because we would ask other rafts coming by if they saw them. For about twenty minutes we waited. It was long and nerve wrecking. Later Nate told us that he kept getting sucked and pushed under rocks, in which he was able to grab onto and climb up. This is me waiting anxiously. The rest of the way went smoothly. No one else fell out, and no one was injured. It was a successful trip. We quickly packed up our rafts, loaded them in Kendell's truck along with the rest of the gear, and some of us headed to Jackson. This I have to say is a record for me. Visiting Jackson twice within two weeks. Impressive. Nevertheless I was excited to go back. I was finally able to go into the Cowboy Bar and get my picture on the bar stool. The bar stools are saddles and I have always wanted a picture sitting on one. When I lived in Jackson two years ago I wasn't twenty one yet and every other time I've gone to visit, no one has wanted to go in there. When Nate and Reed headed in I was instantly in two. It was kind of exciting having to show my ID to get in. Yes I am twenty two and old enough to go in. 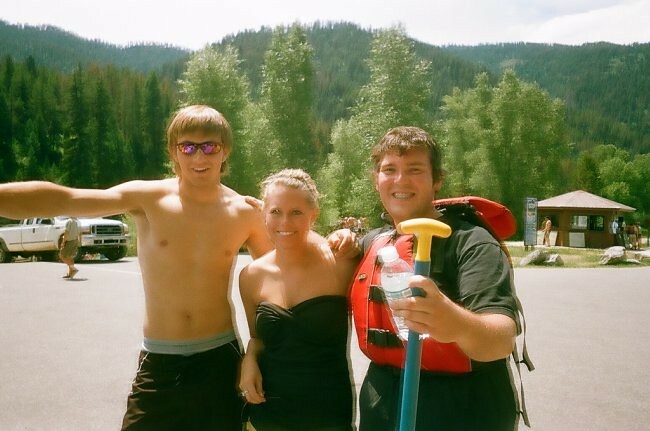 Not everyone who went rafting went to Jackson to eat. Here is our small group and even then we had split up also going to different places to eat. I went to Billy's Burgers which have the greatest and most juiciest hamburgers. Oh so good! We walked around and I bought a couple of books that I can write in from a store called Al*ti*tude. The store had a lot of cute stuff and I wasn't planning on buying anything, but when I saw the two books I knew I had to have them. You'll have to ask me about them if you are curious as to what type of books they are. It was an all day trip and totally worth it. We were all exhausted afterwards, but it was so worth it. After we got back I headed to a bonfire on Dan's farm. That was another adventure all in itself, which consisted of loosing someone's blackberry phone and me going back today to look in the middle of the field for it. I found it. If you're curious I'll tell you all about it. love your freakin cute swimsuit!